ANAHEIM, Calif. -- For the second time in the World Baseball Classic, the US must turn to Roger Clemens to save it from elimination. That situation presented itself after the US again dropped the middle game of the round, this time a 7-3 loss to Korea last night at Angels Stadium, setting up Thursday's must-win scenario against Mexico. Dontrelle Willis has been the drag among starting pitchers for Team USA, losing both middle games. Tagged with the 8-6 loss in the first round vs. Canada when he allowed five runs on six hits in 2 2/3 innings, Willis wasn't much better last night. 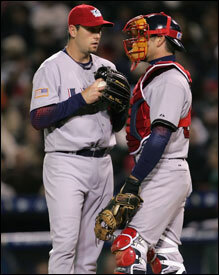 Even having Jason Varitek as his personal catcher has not helped Willis find his command. His delivery and release points have been all over the place. Last night, Willis walked four over three innings, allowing four hits and three runs. In the first ining, he was touched for a solo homer by Seung Yeop Lee, the 30-year-old slugging first baseman of the Yomiuri Giants, and then walked designated hitter Tae Kyun Kim before allowing hits to Ji Man Song and Bum Ho Lee. Clemens had a heart-to-heart chat with Willis Sunday, but his words of advice did not have an effect. ''The guy's got a big heart," said Clemens before last night's game. ''He's a tremendous competitor. I enjoyed seeing that part of him. And like I said, mentally, he has to be tough. ''He has to really, really focus because as you know with his mechanics, for him to repeat and hit spots in that strike zone, he really has to focus on what he's doing out there to be able to get strike one and go from there and expand the zone and so on and so forth. So it takes a lot of concentration to be able to do what he does." But the Florida Marlins lefty, who finished runner-up to St. Louis's Chris Carpenter for Cy Young honors with 22 wins last season, wasn't doing that. With the US down, 2-0, after one inning, the sizzling Ken Griffey (7 for 13 entering last night) stung a solo homer off Min Han Son with two outs in the third. But that was as close as the Americans would get. Korea didn't let up on Willis in the third, playing small ball to manufacture a run. The inning started with Willis hitting Tae Kyun Kim on the right leg. The Koreans had their No. 5 hitter, Ji Man Song, lay down a bunt to advance Kim to second. After Bum Ho Lee's ground out advanced the runner to third, Kab Yong Jin singled in the third Korea run. The Americans squandered several early chances. They put Vernon Wells and Derek Jeter on base in the first but came up empty when Varitek struck out with the bases loaded. In the fourth, they loaded the bases again before former Red Sox reliever Byung Hyun Kim got out of the jam by striking out Wells. In the bottom of the fourth, pinch hitter Hee Seop Choi (of the Dodgers) smacked a three-run homer down the right-field line, expanding Korea's lead to 6-1. The US lineup couldn't muster much against Son and a cast of relievers with all sorts of funky deliveries and arm angles. Korea manager Sik Kim looked like Tony LaRussa with his matchups. The US was without Johnny Damon for the second straight game. Damon, who is 1 for 7 in the WBC, has basically been benched, while also resting a sore left shoulder. He likely will not play Thursday, either, with Mexico starting a lefthander. US manager Buck Martinez also sat first baseman Derrek Lee, who was 5 for 14 (.357), to give Mark Teixeira a start. Red Sox reliever Mike Timlin allowed a run in one inning of work. Clemens, because he's pitching Thursday, will not have enough rest to start any of the final-round games (unless he throws fewer than 50 pitches), but he could be used in the bullpen. ''I'm just leaving myself open for them, for whatever they decide they need or want me to do," said Clemens. ''And right now, the latest is I'm starting Thursday, and that's it as far as I know."